Hey y'all! It's one of the biggest shopping weekends of the year and I'm here to lend a helping hand! 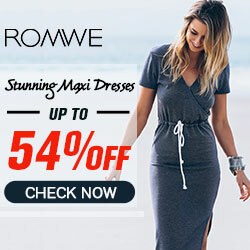 There are two amazing deals going on right now at Shein and Romwe! Head over to Shein to receive up to 85% off this weekend AND free shipping on Cyber Monday! Head over to Romwe to for up to 80% off deals this entire weekend! What are you waiting for? These deals are too good not to take advantage of!